In the past 20 or so years, Belgrade has become much more accessible. Whether by car, train or plane, many routes have been opened and renewed, making travel much less of a hassle. Belgrade has an excellent network of long-distance buses, connecting it to all parts of Europe. The Central Bus Station, one of the ugliest structures to be seen on entering the city, sits next to the former Central Railway Station, so the same warnings about pickpockets and taxi crooks apply here. The same goes for the info on how to get to the city centre. The station features exchange offices, ATMs and left luggage office. Arrivals are physically separated from the station building, they are located across the street, next to a park. You can find a tourist info centre at the neighbouring railway station. Belgrade lies at the intersection of E-70 and E-75 motorways. Foreign drivers in Serbia need an international driving license, vehicle registration certificate, and insurance policy. The valid insurance policies are issued by signatory countries of the “Vehicle Insurance Convention”, and citizens of other countries are required to buy an insurance policy on entering Serbia. You cannot miss Belgrade, because the motorway runs through the city. The speed limit in the city is set at 60 km/h unless otherwise indicated by speed signs. After the UAE-based Etihad Airlines bought a stake in the venerable JAT Airways, the latter transformed almost overnight in a modern operation now known as Air Serbia, with many new direct routes opening in recent years. Currently, some 28 airlines service Belgrade, a lot of which are low cost. Most European cities are covered by these, yet there are still many more planned. The local airport, Nikola Tesla, is 18km away from the city centre, making it very accessible. Although there are a few bus routes to the airport (the A1 is the most frequent, with stops in New Belgrade, Savski Trg and Slavija Trg, and the 300din fare can be paid to the driver), the easiest option is taking a taxi. Just make sure you secure one through the official taxi stand in the arrivals gate where they will give you a fixed fare, ensuring you don't get ripped off. The less known and much cheaper airport in Serbia is Constantine the Great in Niš. 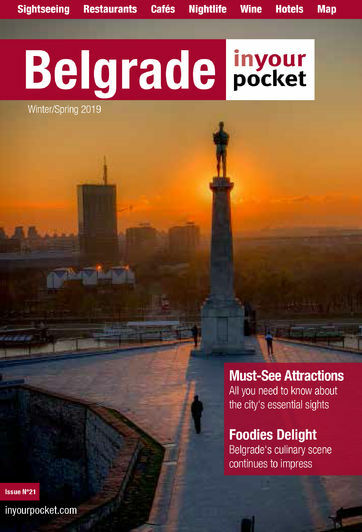 And although you can enjoy the cheap transportation via Ryanair and the likes, if your final destination is Belgrade, you will have to add another 3 hours to your journey.